Alexander II, b 29 April 1818, d 13 March 1881 in Saint Petersburg. 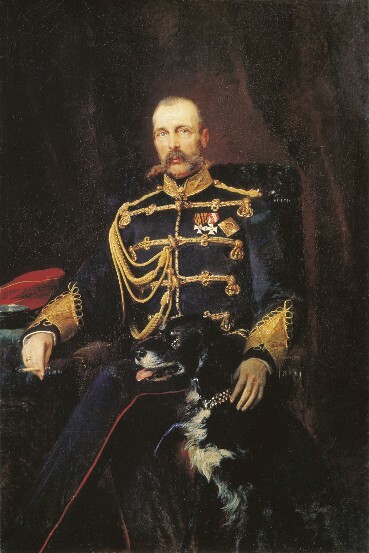 (Portrait: Alexander II.) Russian emperor in 1855–81, son and successor of Nicholas I. Alexander's reign began under difficult conditions: Russia's defeat in the Crimean War, a crisis in the system of serfdom, increasing peasant unrest, and social conflict. This forced Alexander to attend to important reforms: the emancipation of the peasants (1861), the introduction of limited self-government by the zemstvos and partial westernization of the court system (1864), the overhauling of municipal government (1870), and the introduction of universal military training (1874). Alexander's foreign policy was based on an alliance with Prussia and Austria-Hungary and continued Nicholas I's policy of eastward expansion (the Russo-Turkish Wars of 1877–8, the conquest of Caucasia in 1864 and of Central Asia in 1865–76). After suppressing the Polish Insurrection of 1863–4, the Russian government took decisive steps to eradicate Polish autonomy and influence and the power of the Catholic church in Right-Bank Ukraine, Belarus, and Lithuania. During Alexander's reign the Russification of Ukrainian culture and the suppression of the Ukrainian national movement intensified. In 1863 the Valuev circular declared that ‘there was not, is not, and cannot be a Ukrainian language’ and restricted Ukrainian publications. The Ukrainian Catholic church in the Kholm region and Podlachia was abolished in 1875. The Ems Ukase of 1876 prohibited the Ukrainian printed word and theater. The growth of radical populism, particularly in Ukraine, provoked government repressions, which in turn escalated antigovernment terrorism. Faced with this situation, the government prepared administrative and constitutional reforms that aroused hopes among Ukrainian liberal circles. But Alexander's assassination in Saint Petersburg by Narodnaia Volia revolutionaries put an end to these projects and hopes.